This is the third and final review from our family trip to the Florida Keys. We started off the trip staying at the Hyatt Place Marathon Key. It is a great hotel for your category 1-4 free nights that you get form the Hyatt credit card. We then moved on to the Casa Marina, a Waldorf Astoria property, in Key West for a night. While we were staying at the Hyatt Place my parents were staying at the Courtyard by Marriott Marathon Key next door. I have to say this is the nicest Courtyard I have ever seen (I am sure there are some really cool ones out there though). It is also the number 1 rated hotel on Marathon Key. The rooms were new and nice, the pool was awesome, and the service was amazing. This will be a little more picture focused since I was not the one who actually stayed there. The Courtyard by Marriott Marathon Key is a category 7 hotel and it costs 30-35,000 Marriott points per night. The cash rate when we were there was $330.75 per night all in. My parents used 105,000 Marriott points for the 3 night stay instead of paying the cash price of $992.25. Because who really wants to pay cash for travel? The Marriott was $100 less per night than the Hyatt Place next door even though it was the higher rated hotel. With the new Marriott Premier credit card’s 100,000 point sign up bonus you would have enough for 3 nights after completing the minimum spend. I think both hotels are a good use for points. This stay worked out to almost 1 cent per point which is a lot better than the standard Marriott redemption. The rates during the off season do dip below $200 per night. The Courtyard by Marriott Marathon Key is located on the western edge of Marathon key. It is located in next to the Faro Blanco docks and marina. I think there were some charters and boat rentals that could be set up right at the marina. The hotel is a two and a half hour drive from Miami’s airport and an hour east of Key West. The lobby is like a standard Courtyard. The desks are to the left when you walk in and there is a little market for snacks etc. off to the side. Across from the desks is The Bistro restaurant. There was also a large sitting area across from the restaurant for mingling etc. It had a few Apple computers for guests to use as well. It was a nice room but I feel like it probably wasn’t used all that often. My mother is a gold member and tried to get a room with a balcony but the only one available was overlooking a construction area. Because of this they decided to go with the standard room with no balcony and they were given a $20 coupon for the restaurant as an apology. The General Manager also dropped by later to make sure they were okay. Pretty amazing service right there. Other then that check in went pretty smooth. The room was a king room with a sleeper sofa. I have to say this was one of the larger room layouts I have seen and I was pretty surprised. It looked pretty new and had a nice tropical color scheme. The Bathroom was large but it was kind of bland. There was a small fridge in the room, not as spacious as the one at the Hyatt Place next door. Besides The Bistro in the lobby area there is the Blue Waters Pool Bar & Grill. My parents ate lunch at the Blue Waters Pool Bar & Grill a few times and had breakfast at The Bistro once. The pool bar had decent food at pretty standard resort prices. They said the breakfast in The Bistro was underwhelming for the price. For dinner you could always take the quick walk to the Light House Grill that is in front of the marina. The food there is very good and if you get to the restaurant before 6PM you can get any entree for $19.99, a pretty great deal. The Courtyard by Marriott also offers a courtesy shuttle and they dropped us off and picked us up at Burdines Waterfront. They try to keep it within a mile or two of the hotel. The pool was on the smaller side but it is a beautiful infinity edge pool overlooking the water. They also offer Jet Ski rentals right behind the pool. 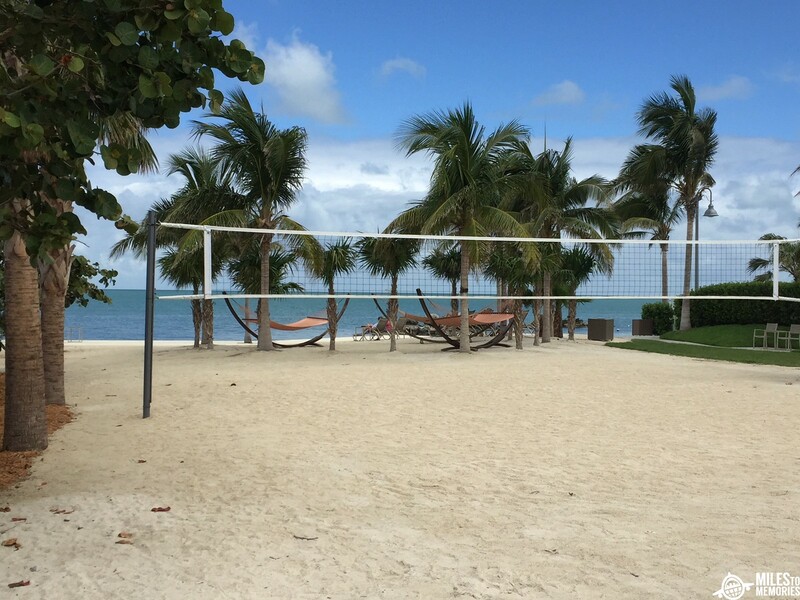 There is a little beach area with a volleyball court and some hammocks just outside the pool area. It isn’t a true beach since the sand ends at a break wall but in the Keys it is more than most have to offer. My kids still enjoyed playing in the sand for a little bit. The hotel had a few games out by the pool area. They had a section set up for corn hole, a large Jenga game, and a fish hook game that everyone failed at, except for my 6 year old somehow. You have to swing a ring on a string and get it to latch onto a hook on the tree. I must have tried 25 times without coming close. Fair warning they do not remove their seaweed as an environmental choice so it can get a little ripe by the shoreline. My parents ended up moving over to the Hyatt Place next door for a few nights after staying at the Courtyard. Because they stayed at both places I thought it would be good to get their take on which one was better. My parents said they liked the Hyatt Place slightly better since there were two pool options and you could bring your own drinks and snacks down to one of the Hyatt pools. They also liked the set up of the rooms a little bit more and that the Hyatt Place came with free breakfast, at least for now. Overall the Courtyard by Marriott Marathon Key is a beautiful newer hotel. It has a great pool and outdoor bar area and every member of the staff gave top notch service. The hotel does lack a true beach which limits the full blown tropical feel. This is a problem throughout the Florida Keys though. While the poolside restaurant is great you will probably need to venture out for breakfast and a few dinners. The cash price was high while we were there and I couldn’t see myself paying more than $200 a night and leaving happy. The points price is pretty fair in my opinion but it is difficult to rack up Marriott points outside of sign up bonuses or paid stays. If you are on your way to Key West and want to crash for a night or two it is a great option. But as for the main destination I am not sure if it is worth it. I do think the Hyatt next door offers a better award redemption based of the ease of racking up Hyatt points with Ultimate Rewards. 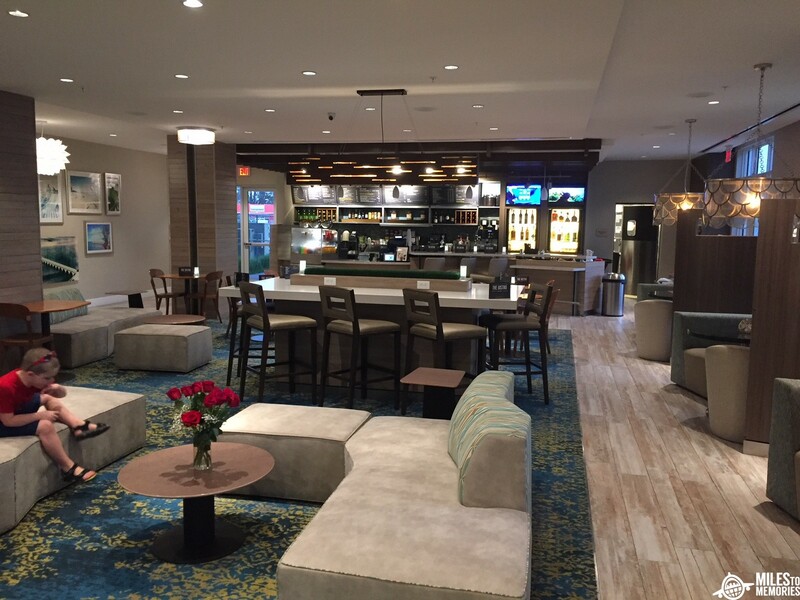 The Courtyard by Marriott Marathon Key is a newer hotel that is well maintained with a very attentive staff. The cost is a little high but comparable to other hotels in the area. Previous articleHilton Honors American Express Business Card Review – Brand New Card! Many years ago, I lived in South Florida and, honestly, the Keys were somewhat of an afterthought to me. I didn’t think it was the best place in the state to vacation. But now that much of the state feels like wall-to-wall development, I like the Keys better! It just feels more like a vacation, with a lot of old-time Florida charm. The problem with vacationing in the Keys, though, is that room rates seem very expensive. As you’ve noted, these Marathon upscale motels are routinely charging $300/night. I like them, and I like Marathon, but there’s no way these properties are “worth it.” I just wouldn’t vacation there at those prices. Fortunately, at least for the moment, we have the option to use points. It’s pretty easy to gin up Hyatt points in the Chase program. I hope the Marathon Hyatt Place hotel doesn’t move up another category, because that would kind of kill the value on points, too. The Keys have a vibe unlock any other place in Florida – Marathon has a vibe all it’s own too. Very different from Key West which is surprising since they aren’t very far apart. The Hyatt Place is a great use of points or for a credit card anniversary night – it would be a shame if it got bumped up. I probably wouldn’t want to stay there at 20K a night. It feels just about right at 15K per night.